I will admit, I wanted to read this book based only on the cover alone. It’s gorgeous! Plus I read Renee’s, Wrath and the Dawn duology, and loved those, so I assumed I would like this as well. 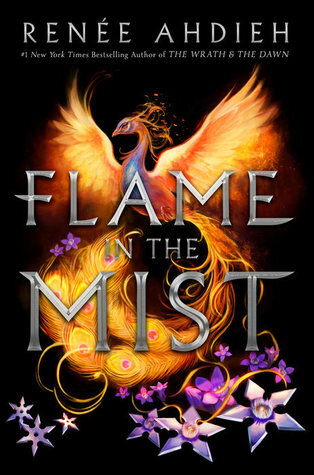 Flame in the Mist had a very Mulan feel to it, but with a twist. It felt real. I thought I was living the story, instead of merely reading it. Pure magic. Mariko’s life isn’t headed in the direction she wishes it would go. After falling into the hands of the Black Clan, she must conceal her identity and slowly find the answers to why her life was threatened. But as she grows closer to the Black Clan, she realizes that some things aren’t what she originally perceived. There’s more to these men than she’s been told. As she learns to fight with these men, she grows closer to one in particular. And when he learns her secret, her entire world gets turned upside. I do enjoy escaping to a foreign land, and Renee’s books let me do just that. They’re filled with the perfect combination of adventure, fantasy and romance all set in the beautiful locations. My heart was racing, and stopping, at quite a few spots. I am rather anxious to read the next one! !